Bus changes set to come into force… How will they affect you? 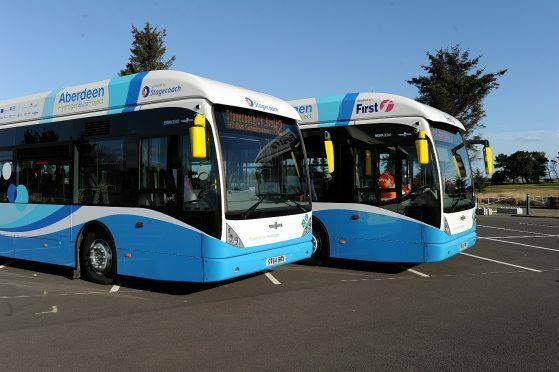 First Aberdeen is making changes to routes in the city. A raft of changes to bus services in Aberdeen will be introduced at the beginning of April. The alterations, according to First Aberdeen, include new services and improved frequencies – plus a series of service alterations to take account of the closure of Broad Street. They are being implemented after a period of consultation with customers and with the approval of Scotland’s Traffic Commissioner. One major change will be the withdrawal of the number 27 service from the city centre to the airport via Kirkhill Industrial Estate: this is due to a lack of passengers caused by the oil industry downturn. A statement from First Aberdeen read: “Regrettably, this service will be withdrawn due to low passenger numbers. However, new services will increase the frequency of other services to the airport. A new 16 bus will operate from the city centre to Aberdeen Airport and Dyce Park via Great Northern Road, Auchmill Road and Inverurie Road. The service will operate in a one-way loop via Dyce Drive and Argyll Road to Aberdeen Airport terminal, returning via the Airport Link Road, Dyce Park and Choose site, and via the A96 Inverurie Road. It will operate every 15 minutes from Monday to Saturday and every 30 minutes on Sundays. And there will also be a new 117 service, which will operate from Monday to Friday and on Bank Holidays. It will go from Aberdeen City Centre to Kirkhill Industrial Estate via Denburn Road, Hilton, Auchmill Road, Stoneywood, Wellheads Dr and International Avenue. Coverage of industrial premises in the Dyce area will increase, whilst reducing journey times from the city centre and the A96 corridor. Daniel Laird, First Aberdeen’s commercial manager, said: “We outlined our proposals in February and were keen to gather feedback. We’re very pleased that the proposed changes met with such a positive response. The changes will come into force on April 2 and full timetables will be available soon on the First Aberdeen website.